"Hi, my name's Dada, and I need to eat more coffee." When they're not too busy calling me "Uncle Russ" or "Rusty" or threatening to eat my head, this is how my kids (almost five and two and a half years old) are choosing to mock me these days. I suppose it could be worse. But imagine a little voice saying that, in a mockingly deep and somewhat serious tone. And yes, it's a true statement. Except for eating part, especially that the TJ's coffee craze has seemingly subsided. Now that it's after Memorial Day, it's officially cold brew coffee season. Hot coffee, when hot outside, is awful. No one needs that. But a well done cold brew coffee? Rich and smooth and delicious, with a roasted sweetness tacked on? Yes please. All summer along. 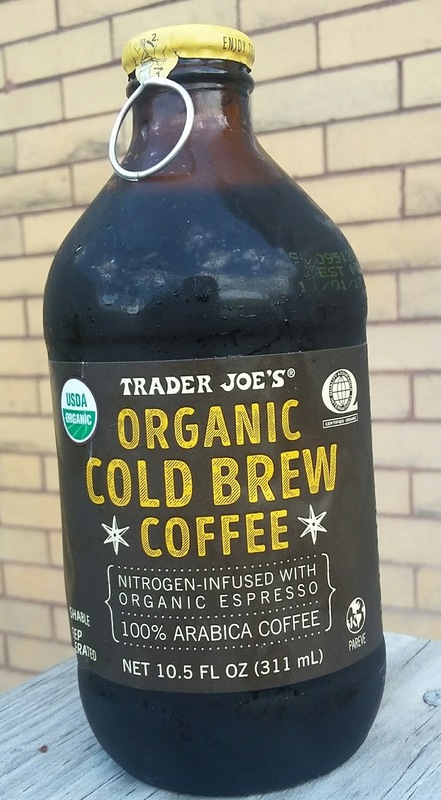 Trader Joe's Organic Cold Brew Coffee is precisely that. 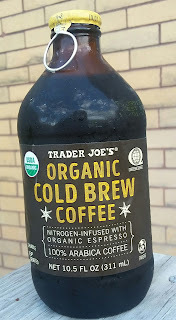 If not for the new coffee shop that just opened down the street from us, I'd be stocking up even more on the TJ brew. There's not much to nitpick here. Heck, I even love the bottle, with the oddly satisfying pull-ring pop cap. When that cracks open, it did something for me. Can't explain it. But it did. 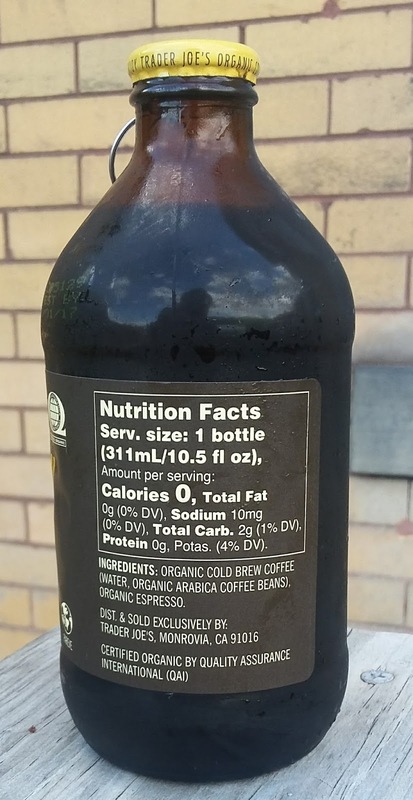 The cold brew is decidely dark, with a full on flavor that I thoroughly enjoyed drinking black over some ice. One is supposed to "pour hard" to apparently activate the nitrogenation of this beverage...um, okay, sure. there might be something to that. I'd be lying to say that I noticed one way or another, so if that is a failure of my pouring technique, so be it. I did what I could. I heard from our TJ's cashier that some have said this coffee is decidely high octane with extra caffeeine. It might be that espresso they tack in. Again, haven't noticed that myself, to be honest. At time of writing I drank this several hours ago while grilling dinner, and I could go to bed within five minutes and be fine. Must be those kids driving me crazy over a long holiday weekend. A bottle costs $1.99 and can be found in the refrigerated area, in our particular store near the yogurt and juices. Compare to the normal coffee shop prices, and it's not an awful deal. I'd tell you what Sandy thought of it, but I kinda, without thinking too hard about it, drank most of it with her getting only a small sip or two. I don't know why she didn't get her own. Oh well. Must have been lack of coffee - it's not just Dada who's so caffeine dependent, after all. No real complaints, and is in fact pretty robust and tasty, so let's just say it's pretty darn good. The spiel on the back of the bag here claims this dish is inspired by elote, a style of Mexican corn often sold by street vendors. Every time I've seen it sold on the street, it's been on the cob. I had my first ear of elote some eight years ago when I lived in Southern California. Delicioso. There are definitely some similarities here and maybe a few differences. Let's take a look. First of all, each kernel of corn is pristine: whole, plump, robust. They're far more perfect than anything I've witnessed on the streets of L.A. It is kinda fun to eat corn straight from the cob, but you can scoop the niblets into your mouth at least twice as fast with this Trader Joe's offering, provided you have a big enough fork and spry enough food-shoveling hand. And the kernels are all in various states of roastedness—some are deeply charred and black, some are yellow and barely scorched at all...but most are somewhere in between, not unlike traditional elote. With the TJ's Mexican corn, there seems to be a lot more oil and sauce. 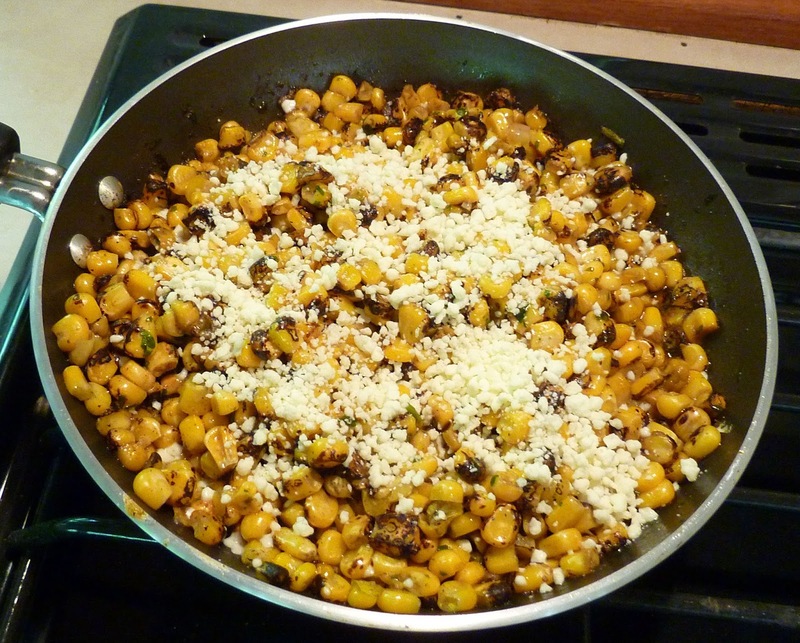 With traditional elote, you might have butter, chili powder, hot sauce, lime, and a few other seasonings. The overall flavor is very similar, but I prefer the texture of the traditional seasonings to the unusual dissolving pellets of sauce that come with this product. I didn't dislike them by any means, but I'd still prefer to administer my own personalized amount of seasoning from the shaker(s) of my choice. 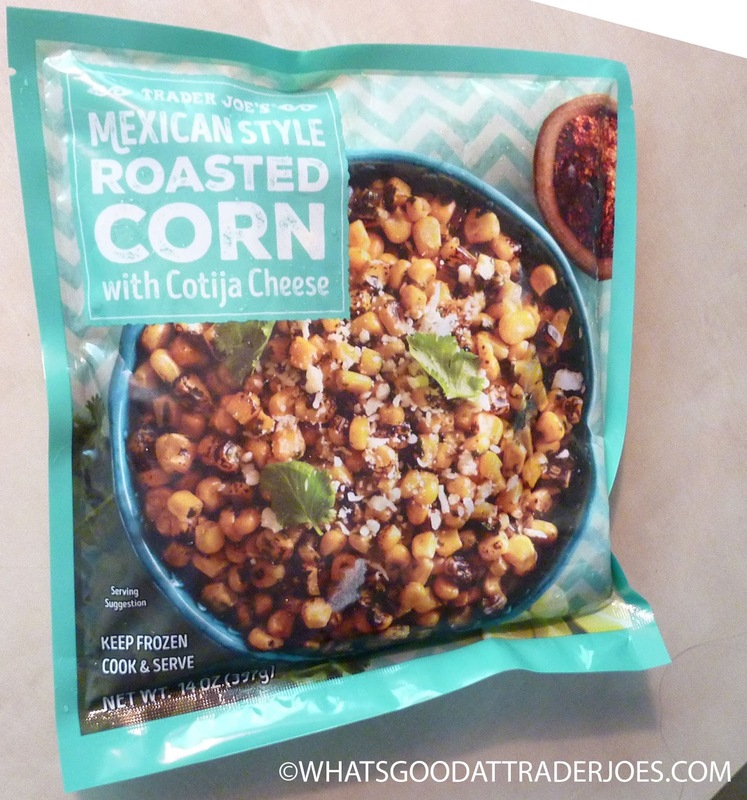 But by far the most disappointing aspect of this product is the exceptionally tiny packet of cotija cheese. It provides a delightful zip to the dish, but there's simply not enough of it to go around. I immediately found myself zeroing in on the clumps of corn that had the most cotija within them and quickly depleted my dish of the coveted cheese while more than half of my corn remained. The corn isn't terrible by itself. The sauce/seasoning alone makes the dish enjoyable, but the mixture isn't nearly as memorable without the cotija cheese. In my humble opinion, at least twice as much cheese is required here. Sonia likes the corn and says it reminds her of her childhood, but she insists the sauce isn't spicy or flavorful enough. She agrees that more cheese is needed, as well. Three and a half stars from this gringo. A meager three from a Mexican-American woman that grew up eating elote on a regular basis. At this point, I think we all gotta admit it: The world's most versatile vegetable is cauliflower. Sure, some others deserve credit/honorable mention. Like, say, carrots, especially in light of their incredible noodle impersonation. Never saw that coming. Zucchini can do a similar trick, too, of course, and is tasty in all sorts of preparations. ...but now pizza crusts? You can do that? That seals it right there. 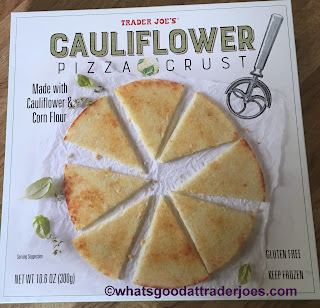 Please see Trader Joe's Cauliflower Pizza Crust. Took me a minute to comprehend it myself. Advantages: gluten-free, if that's a concern you have. Less carbs. More fiber. When covered in toppings of your choice, the inherent caulifloweriness of the flavor kinda fades to the background and makes an almost believable bona fide pizza crust. Disadvantage: See picture. Flippety-floppety, soft and bendy. 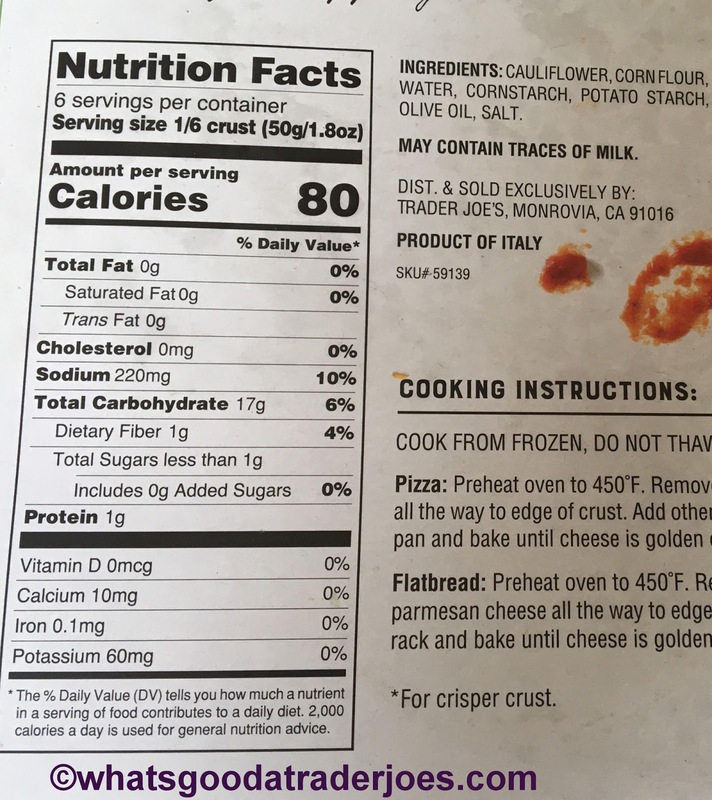 We followed the "for a crisper crust" prep method on the box by placing the frozen cauli-corn disc directly on the oven rack. To my amazement, it didn't disintegrate and leave a crumbly Superfund-level disaster zone on the oven floor. The thought of scrubbing out scorched pizza remains definitely crossed my mind, but thankfully it did not come to pass. It browned a little, but remained soft and floppy....if this were a regular crust I'd say soft and super-doiughy, but that's not quite right. It did, though, stay intact. All that being said, both Sandy and I liked it, as did the kids. 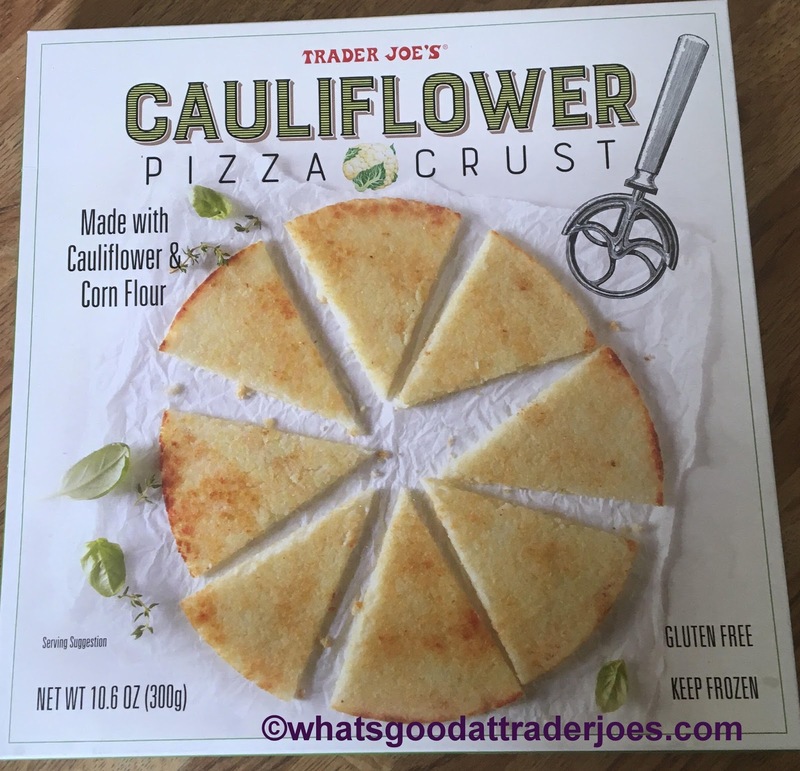 Both kids didn't believe us that the crust was made of cauliflower, so this might be a way to sneak some extra veggies in your youngin's. We'll probably pick it up again and see if baking the crust by itself first before adding toppings makes it a little crisper to our liking. Cost $3.99, which sounds like a lot until you consider how involved it would be to make your own. Use for pizza or making flatbreads or breadsticks....all without the bread, of course. More power to the cauliflower. Sonia thought this chocolate bar was from Botswana. It sounds silly, but if you don't read the type carefully, the two words are only a couple letters off, so it's an easy mistake to make. And I mean, how many of us really use "boatswain" in our daily lexicon? Not I, certainly. Indeed, I had to Google it. It's the dude that maintains the equipment on a ship, apparently. What he has to do with stout and/or chocolate, I'm not sure. Now, I've had chocolate stouts before. But this here's a stout chocolate. And I'm a stout man. And by that, I mean both that my body type is somewhat thick currently, as well as the fact that I do enjoy a good pint of stout or porter from time to time. It's a double entendre. Get it? Funny? No? No you don't get it, or no you don't find it funny? Whatever. Anyway, on with the review. 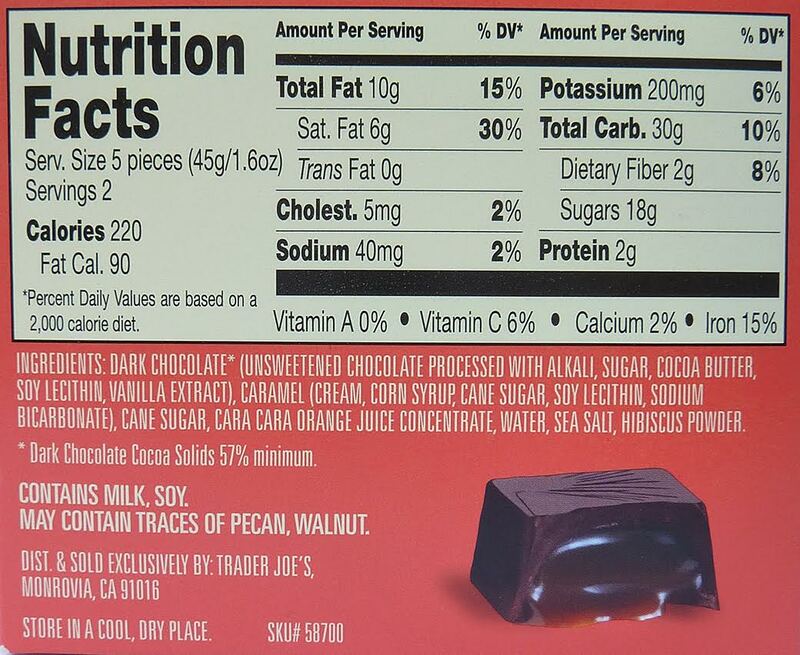 This chocolate is dark. 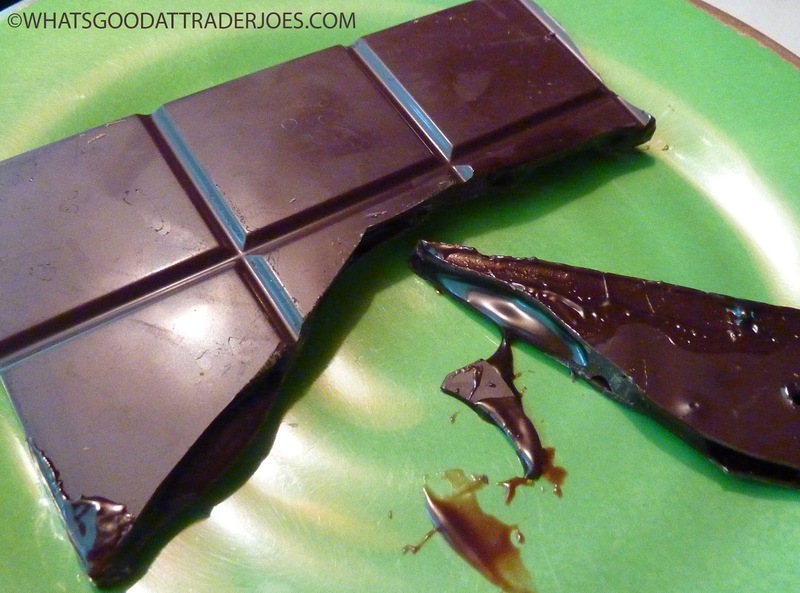 70% cacao, as we've seen quite often before at Trader Joe's. It apparently goes well with stout, coconut, black sea salt, and bacon, among other things. And at least in this case, Sonia thinks it's the perfect choice. I always prefer sweeter chocolates. 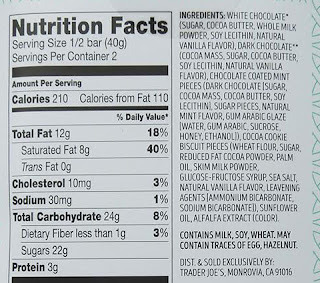 If people aren't scolding me, telling me my chocolate isn't really chocolate, then I probably don't like it that much. Except in this case, there's a vague stout-ness about the product that keeps it interesting—but overall, it's just too dark for my tastes. Yes, I know that stout tends to be bitter as well, but somehow that works for me. I like my beer bitter and my chocolate sugary. But I'm weird like that. Even the caramel here is dark and slightly bitter. 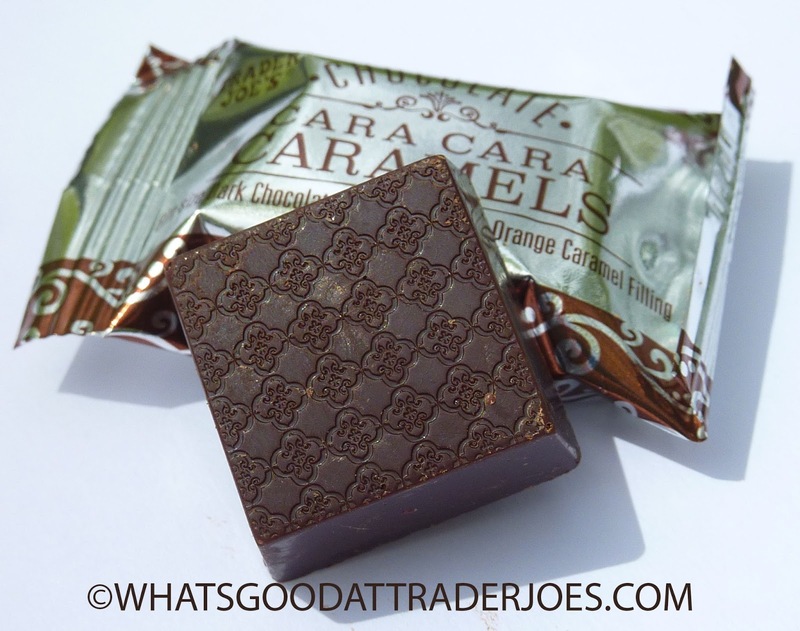 It seems thinner than most caramels, as far as consistency goes. 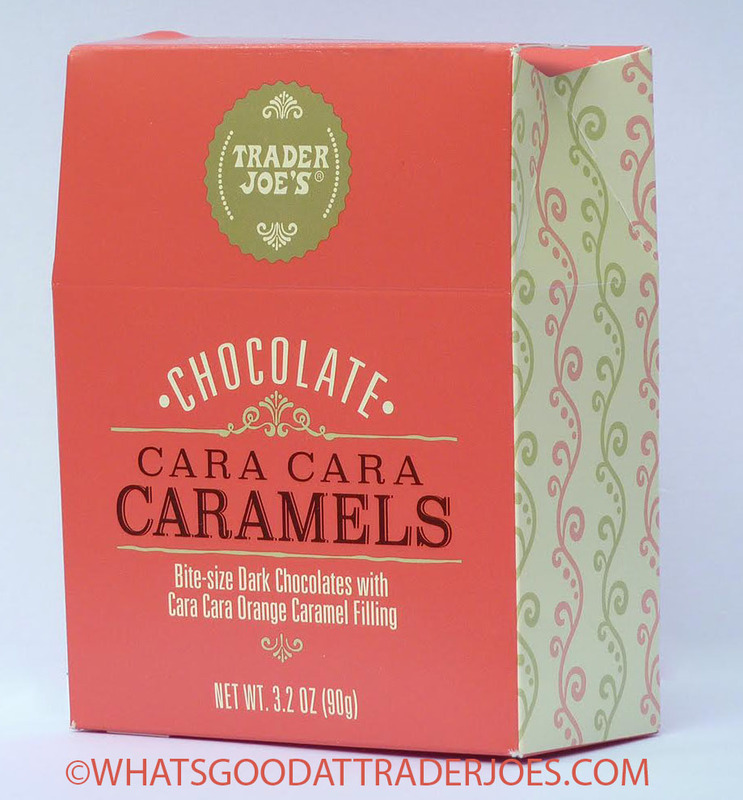 It's comparable to the caramel in the cara cara caramels in that sense. The thinness makes it even more messy, since it wants to run out of the chocolate bar quickly—almost more syrupy than caramelly. 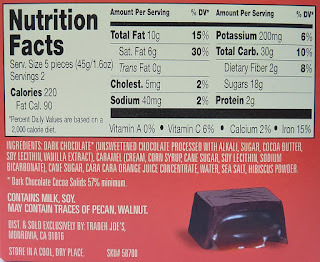 The bar is made of eight big squares of chocolate. It has a very low profile. I want to say it's less than an eighth of an inch thick, but I don't have a ruler on me, so...don't quote me on that. It's thin enough that most bites will dissolve on your tongue in short order. Sonia loves the flavor and would buy it again, although she claims she doesn't taste much stout here. Four stars from her. 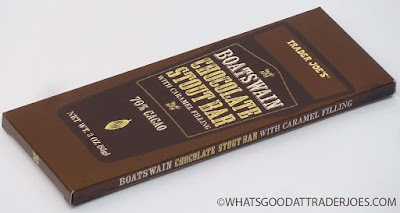 I think the way the subtle stout flavor blends with the chocolate is the most unique and noteworthy aspect of this product, but it's just not really my thing when it comes to desserts. Three stars from me. Mid, moving to late May. You know what time of year it is. This is when it begins to get hot. Maybe not consistently quite yet, but the past couple days out here in the 'burgh - yup, hot. Get the iced coffee for the mornings, for those fortunate enough to have AC in their house, crank it a smidge. For more simple folks like us, open the windows, turn on the fans, circulate some air, hope for the best. At least it ain't August yet. That's the worst. Anyways, you gotta get your cool drink game plan down. Do it now, while there's still a chance at some seasonal forgiveness from the heat barrage that's sure to happen. 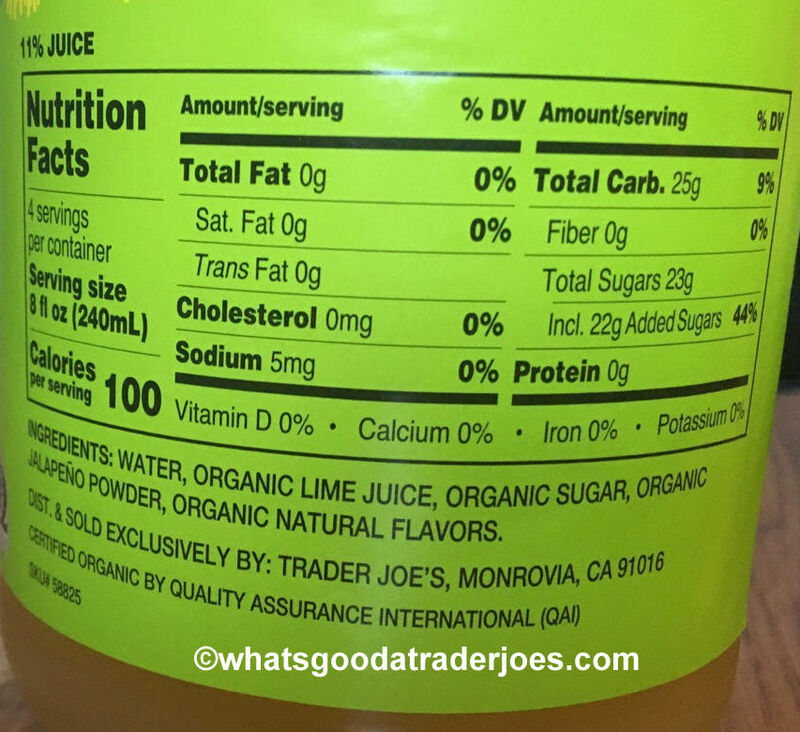 And may I humbly suggest adding Trader Joe's Organic Hibiscus Agua Fresca to the rotation? Admittedly, this a bit out of the comfort zone for me. I know that "agua fresca" means something along the lines of "cool water" in Spanish, and that a hibiscus is one of the many boring plants at the flower shows I used to get dragged to as a kid. I may have had a legit "agua fresca" in Mexico a few years back - papaya if I recall correctly. Tasted more like hot dog water. But I figured I had to give this a try. Glad I did. 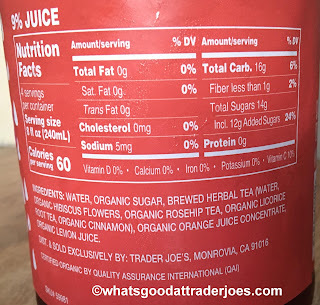 The "subtly-sweet juice beverage" description is fairly accurate. 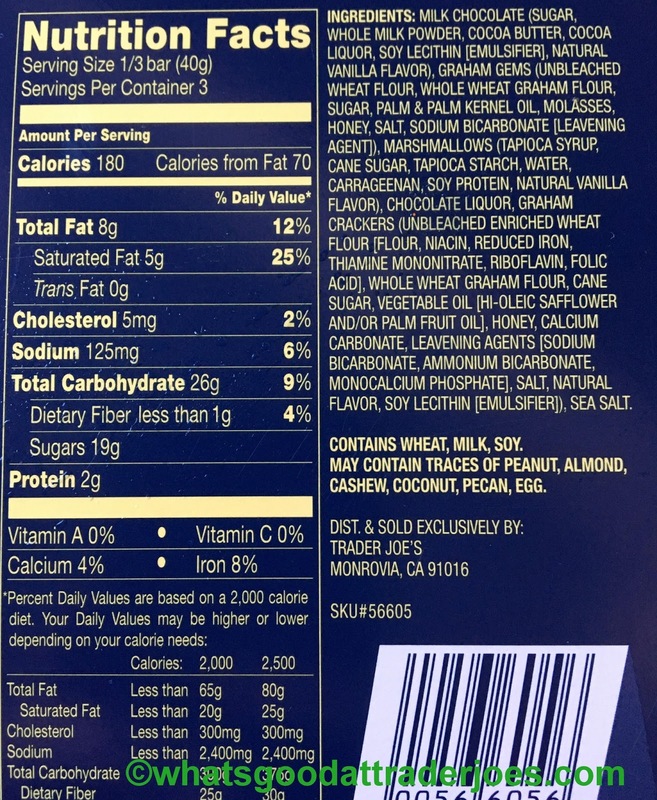 There's a lot of flavors at play here, but sugar for the sake of sugar is, thankfully, not one of them. There's a cranberry-esque tartness from the hibiscus that carries much of the way through, with a slightly citrusy finish. There's also a definite brewed tea-type element. But it's a light, clean, crisp flavor, that doesn't linger at all. Nor does it sink and feel a little heavy like juice sometimes can. It's good. I haven't given the hibiscus agua fresca the "just mowed the lawn" test yet, but I think it'd pass with flying colors. Will try this weekend and report back if, somehow, it fails. Both Sandy and I enjoyed it quite a bit for the coolness, the crispness, the cleanness. Not too tart, not too sweet - instead, it just seems to balance everything just right. This just might this summer's hot new cool drink. "Them carrot spirals are good!" remarked an enthusiastic Russ on a recent WG@TJ's team email thread. "But aren't they just carrots?" you ask. That's a good question, the answer to which is "Yes...plus sea salt." 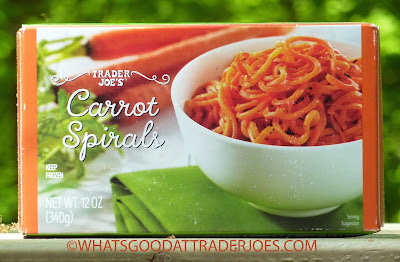 However—and this is a big however—something magical happens to carrots when they're sliced into noodle-esque spirals. They become more delicious and more fun to eat. I don't understand the science behind it all. But it works. Just trust us. They seemed to taste sweeter than regular carrots for some reason, and their essence was just a little more intense. The good flavor might also have something to do with the olive oil we used when we cooked them or the 21 Seasoning Salute we used on one batch, or the Francesco Rinaldi Alfredo Sauce we used on the other. What no Trader Giotto's? No. We do occasionally shop at places other than TJ's. The look and texture of the spirals is somewhat similar to spaghetti squash. When served with the seasoning salute, they seemed slightly more springy and fresh than when served with pasta sauce. The Alfredo made them heavier and a tad soggy. Sonia preferred the spirals with the seasoning, and I did too at first, although the Alfredo version grew on me by the end of the dish. 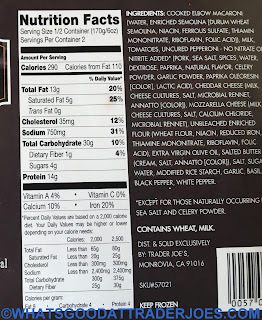 35 calories per serving (without Alfredo sauce, obviously) as compared to around 200 in a comparable serving of pasta? Heck yes. Four solid stars a piece. Bottom line: 8 out of 10. "Oooh it tastes just like camping!" 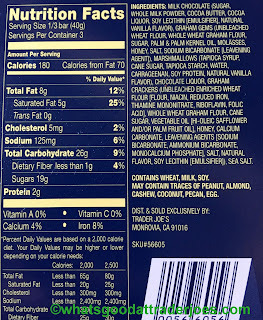 Those are the words I would have expected to hear come out of my wife's mouth after a few bites of Trader Joe's Campfire S'mores Bar. Not like we're big campers...I think we've camped twice together ever. One fun night carcamping at a local state park, the other time an overnight at Joshia Tree National Park...where she was sick all night long. Something like too much In 'n Out after a massage plus fear of killer bees roaming the park and disappointment of not seeing a big horned sheep. Like I said, something like that. That's not what she said, though. Much to my surprise. It was more along the lines of "Eh, it could be better." 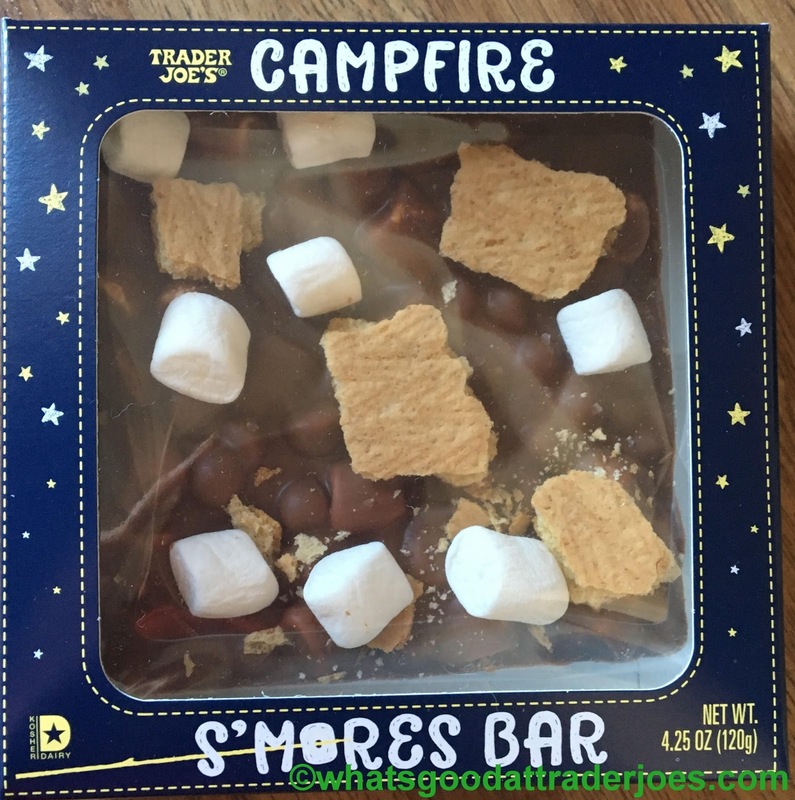 There's not a whole lot necessarily wrong with the TJ's s'mores bar. 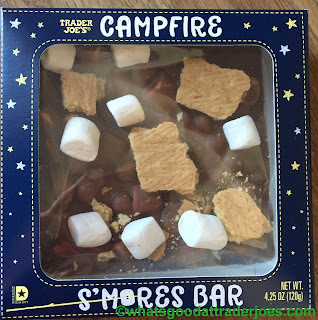 It's a thick slab of decent milk chocolate, with large crunchy chunks of graham cracker and soft, gooey, pillowy marshmallows mixed in and on top of the base. So there's little doubt that the final taste is at least fairly suggestive of the outdoorsy classic. Except that "outdoorsy" part, of course. Those marshmallows aren't even toasted, let alone blackened and crispified from being set ablaze. No bugs. This is about as "outdoors" as camping at a Motel 6. There's nothing truly "campfire" about it at all. Sandy would have preferred more of an inside-out s'mores bar type deal though. I'm positive she'll correct me in the comments below, but I interpreted her construct of choice as being a solid graham cracker with a similarly thick coat of chocolate all the way around, marshmallows embedded here and there. 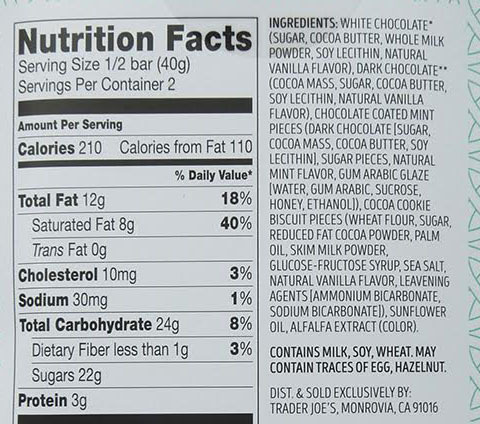 That also sounds tasty and perhaps with better cracker to chocolate ratio. Overall, it's good, not great, not bad. Not as intense as actual camping...get it?...intense... "in tents"...Imma gonna stop this right here. When saying the word "caramel," apparently just about any pronunciation will fly. But in the US at least, there's no debate about the pronunciation of "cara cara," as in a cara cara orange. So just for the sake of consistency, let's all go ahead and continue the whole CARE-uh speech pattern into the word CARE-uh-mel. Use the long A sound in all three words, for crying out loud. It's just so cacophonous to say "CARE-uh CARE-uh KAR-uh-mels" and heaven forbid you say "KAR-muhls" when pronouncing the name of this product. But whatever. I suppose the whole thing is moot point since all of this is written and not spoken and why on earth would I start a debate when there's simply no reason to stir up discord? I guess I'm grumpy because my Caps choked in the second round of the playoffs for the millionth time and I just paid four bucks for ten little candies at TJ's and I'm not even really sure I like them that much. But I definitely don't hate them either. Ahem. 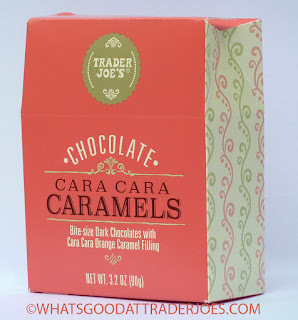 I wasn't done talking about these caramels yet. If you really pay attention, you can taste the orange juice in the caramel, which is a nice touch. Any sweetness in the product is balanced out with the aforementioned saltiness as well as a delicate bitterness. The chocolate is firm and rigid, and the caramel is fairly smooth and runny—almost juicy if that makes sense. This product really grew on Sonia. At first bite, she wasn't sure if she liked them that much. But after a couple pieces, she ended up appreciating them more and more. She's going to settle on a final score of three and a half out of five. I'll go with three out of five since they're expensive. 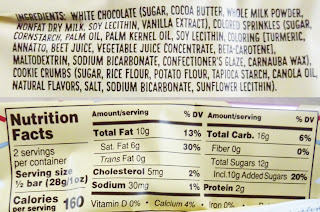 Plus if I'm going to have candy, I'll head for white chocolate over this stuff any day. Oh, this would have been perfect last week, with it being Cinco de Mayo and all, right? There's a couple common misperceptions about Cinco de Mayo. I'll be open to correction here. But I always hear it referred to as "Mexican Independence Day." Uh...nope. Cool idea and all, but seems, much like St Patrick's day, to be American appropriation of foreign culture with a big excuse to drink heavily. No disrespect to the actual meaning behind Cinco de Mayo, of course. Listen, you don't need excuses to drink margaritas and eat tacos. 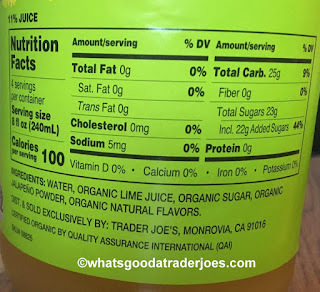 And something that may go well in said margarita or alongside said taco is Trader Joe's Organic Jalapeño Limeade. +1 to TJ's for not labelling it Trader Jose's. As for the drink itself, it's interesting. In an interesting way. Admittedly, to my very gringo self, at first there was a "Mexican" vibe to it, mostly because nothing goes better with most Mexican dishes to me than a little spice and a little citrus lime twist. And that's more or less what the limeade tastes like - sweet limeade, without much bite, smoothly transitioning down to a spicy afterburn courtesy of the powdered jalapeños. The heat factor seems to waver a bit from sip to sip - some seem relatively mild, others with a deeper burn - but to my taste, never delved into unpleasant territory. Your mileage may vary, of course. That's kinda the crux - the jalapeño. It will make or break the drink for you. To me, it kinda limits the appeal somewhat. When I try to discern how refreshing a drink may be, I think if I'd want to drink a beverage after doing a few hours of yard work on a hot day. With that spice, I think this would score rather low...but I'm willing to be wrong. As a plus, that burn mixes nearly seamlessly with a little booze poured in. So there's that. At this point, Sandy and I are both more or less indifferent. There's apparently a Minute Maid jalapeño lemonade that she prefers. Good chance I'll be drinking most of this, slowly but surely. I'm okay with that, but it'll last a while. Nothing much else to say, muchachos. Solid threes from us both. White chocolate lovers, rejoice! All others, go about your business as usual. All three of us in the world that appreciate white chocolate—no, wait...we did get a comment recently from a gal who loves white chocolate, so there must be at least four of us—should totally try this bar. 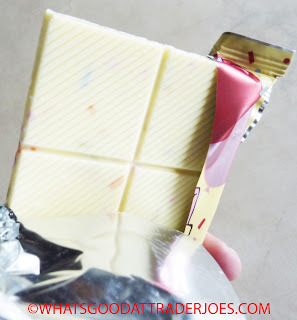 It's great quality white chocolate, very sweet and creamy. What else is going on here? Not a whole lot. But simple is good. Let's take a look. 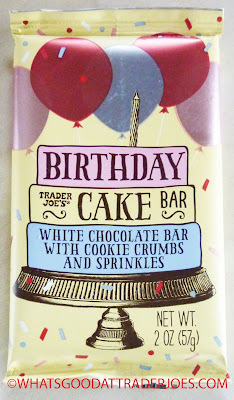 In addition to delectable white chocolate (I'm not a white chocolate supremacist, it's just my personal preference) there are colorful sprinkles and cookie crumbs which give the bar a fun appearance and crunchy texture, although the cookie crumbs are especially hard to detect visually since they're white on white. But make no mistake, they are there. 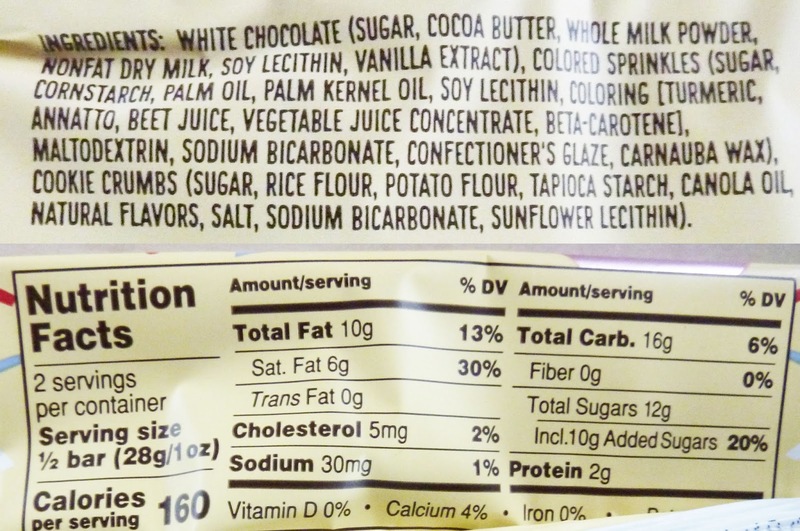 And not only do they add a crispity-crunchitiness, they add a subtle amount of birthday cake flavor, too. There's no kale in here. No bacon. 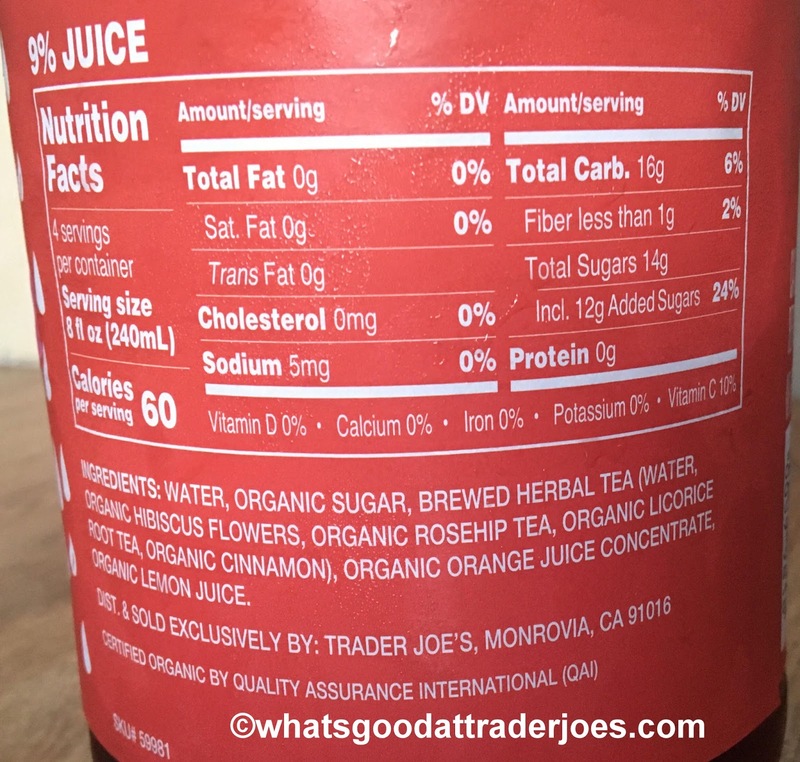 Nothing super weird, although TJ's—or TJ's third party supplier, as the case may very well be—did find a way to work in some interesting ingredients like beet juice and turmeric for color in the sprinkles (or "jimmies" if you prefer) and rice and potato flours in the crumbs. I guess the overall effect is vaguely birthday cake-ish, but mostly, it's just white chocolate. 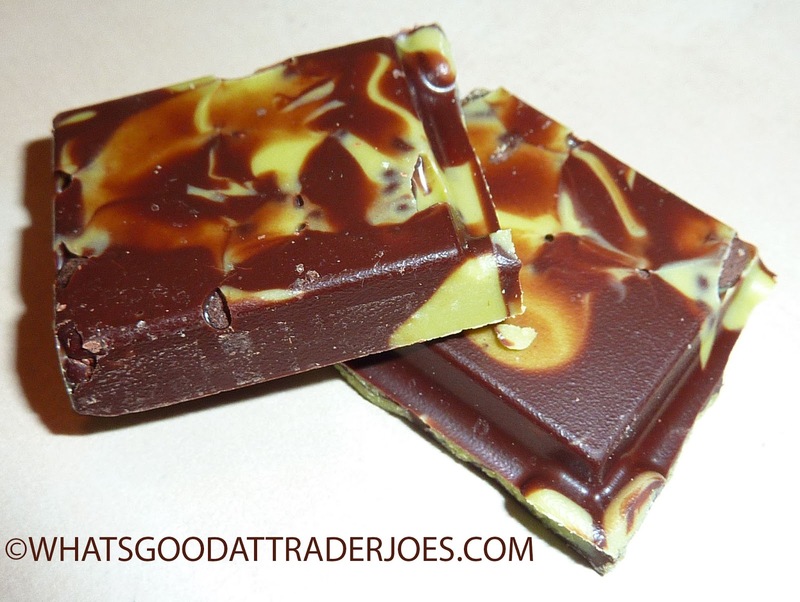 The bar comes in six squares, perfect for breaking off a piece and saving the rest for later, although the product isn't particularly large to begin with. I could have easily polished off the whole thing by myself in one sitting. I did share with Sonia, however, even though she wasn't as impressed as I was. She doesn't like white people that much—er, I mean white chocolate that much at all. She prefers dark and occasionally milk chocolate like most of you silly humans. 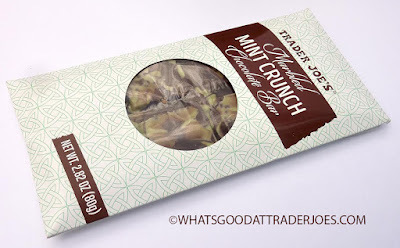 I would have been tempted to push this product into at least the "really darn good" category just by virtue of it being made of white chocolate, but in light of its relatively small size and price tag of $1.99, it's not the best candy value in the store. I still give it four stars and an enthusiastic thumbs up, but my take on it will be offset by my wife (and 99.999% of humanity) with her lackluster three star rating and a thumb not down but sorta in the middle somewhere. Let's have some fun here and talk guilty pleasures. Okay, fine, me first. Let's see...fast food breakfast sandwiches. "If I Could Turn Back Time." Jackie Chan movies. Meatloaf. No, not the dinner classic, nothing to be guilty about that. The singer. No one can deliver such hokey lyrics with such powerful conviction as he. Sandy chimes in with Babysitter Club books. 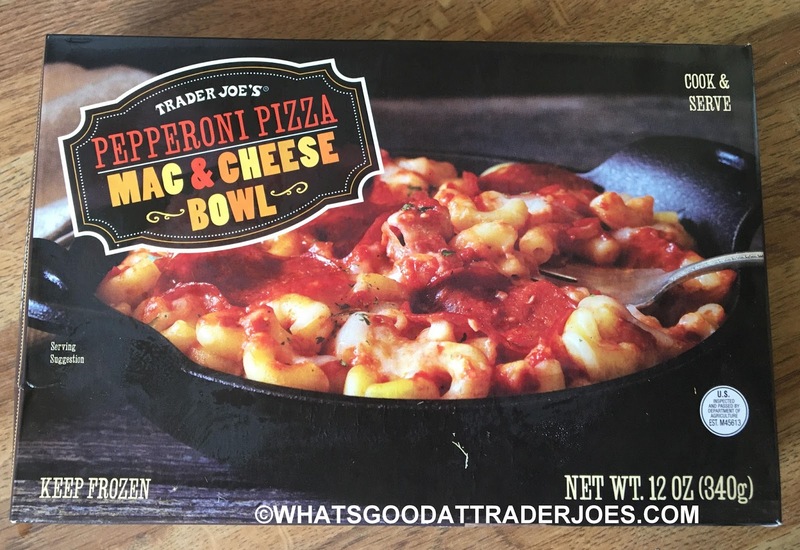 I bring this up in reference to Trader Joe's Pepperoni Pizza Mac & Cheese Bowl, because, well, look at it. Looks ridiculous. Perhaps borderline genius. But really, whose name would you expect to be on such a concoction, Trader Joe's or Guy Fieri's? Thought so. Note: Guy Fieri is decidedly not a guilty pleasure. Anyways, take another look, this time at the product picture. 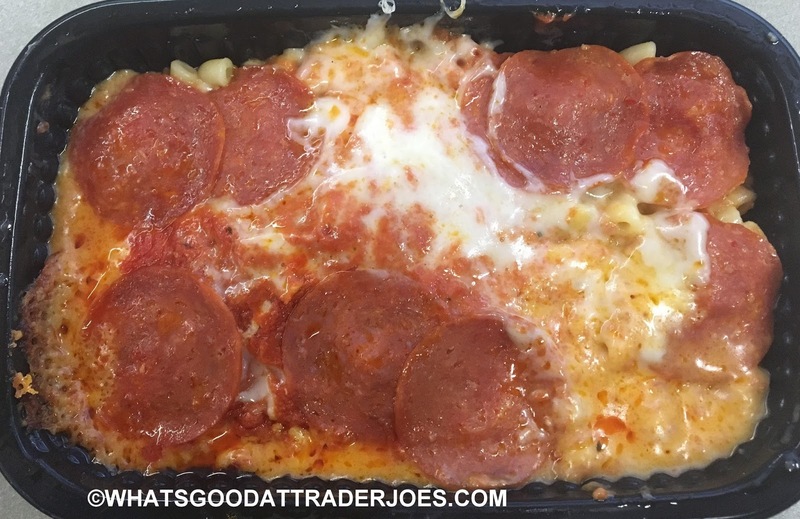 Looks like the cheese and pepperoni slithered off the crust of an average run of the mill pizza and on top of a pile of mac and cheese. And that's really more or less how it tastes. 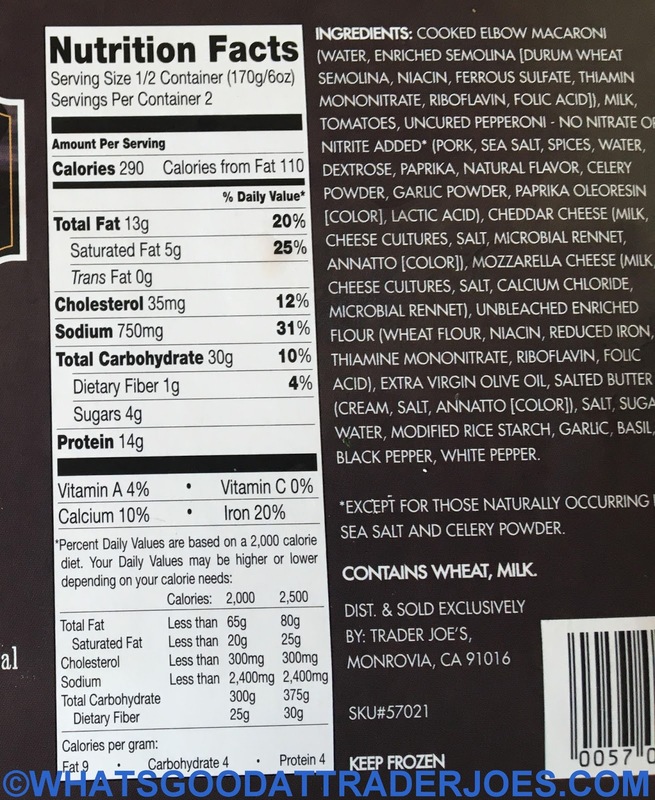 There's some faint cheese flavor to the mac and cheese, and I'm sure it's actually pretty decent stuff underneath. 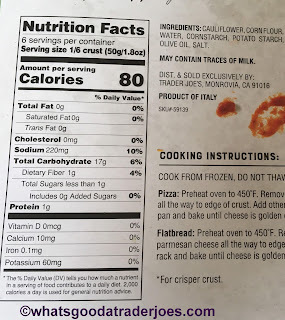 But the pizza portion kinda overwhelms everything, with the greasy marinaraesque mozzarella making up the bulk of the flavor. Not that there's anything necessarily wrong with that. The pepperoni is pretty average and nondescript, a little wimpy in my opinion. I would have loved some thicker chunks over the skinny slices. 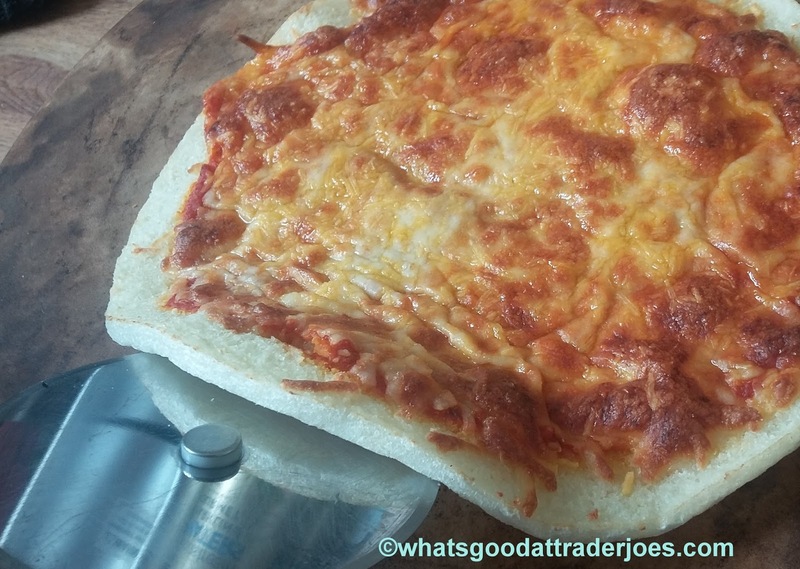 Mash up a freezer pizza with a box of Kraft, and that's more or less what the outcome is. That might be a slight under-evaluation, but not by much. All that being said, I really enjoyed this more than I should have. Two classics mixed into one. There's so much comfort food vibe going on, and that's even from nuking it - baking it would have been even better, almost undoubtedly so. Sandy and I could both eat the whole tray ourselves, it's a good thing we shared. In all, for two all time greats in one go, it's not quite Bowie-Mercury, but certainly not Bowie-Jagger either. It's a guilty pleasure, through and through, and every once in a while, is that such a bad thing? Nah. Between the two of us, Sandy and I appreciate it enough to give it a score a tad bit higher than it probably deserves. Don't judge too harshly, and dig in. A couple things about this product mystify me. The first is the defrosting instructions. They say to defrost from frozen at room temperature for two hours, and then to serve. I'm not sure if we just keep our home a little on the chilly side, but after two hours, these vegetables were still very much on the cold side of room temperature. Even at the two and a half hour mark, they still wanted to crunch a little from the ice crystals left within them. Another thing I don't get is that they recommend serving these at room temperature in the first place, rather than hot. After having tried them both ways, I still greatly prefer them heated—while Sonia preferred them as the instructions specified. Sonia thought maybe that heating them in the microwave would be detrimental to their texture—that they might get more leathery or chewy in the microwave. 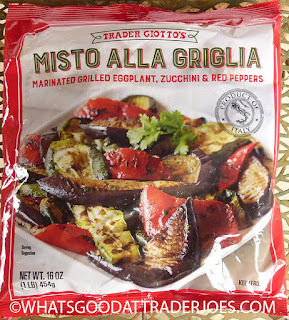 And while I wasn't a fan of this product's texture in either case, I must admit the veggies, most notably the eggplant and zucchini, were slightly less chewy when not heated in the microwave. But something about eating them hot, particularly when served with pasta, made them just barely palatable. My gag reflex wanted to kick in when attempting to consume them lukewarm or cold. The best thing about this product was the marinade of vinegar, oil, and spice, which gave the mixture a nice savory flavor and enhanced the natural flavors of the grilled vegetables. When eaten with pasta, the herby tang of the misto alla griglia spread out beyond the vegetables and served as a nice subtle dressing for our linguini noodles as well. No other sauce was needed—although we did throw in a bit of the 21 Seasoning Salute. But still, I preferred each bite to contain very small bites of the veggies and plenty of pasta, because otherwise I found the texture unbearable. There's always the possibility that we got a bad bag and that your eggplant and zucchini will simply melt in your mouth. 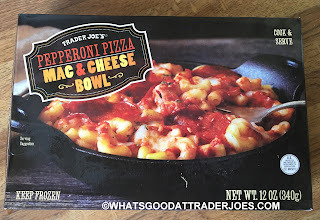 We've already seen eggplant from Trader Joe's go both ways. Click here for a big eggplant win, or here for a big eggplant fail. At $3.99 for the bag, Sonia thinks it might be just as cost effective to buy and grill your own vegetables. 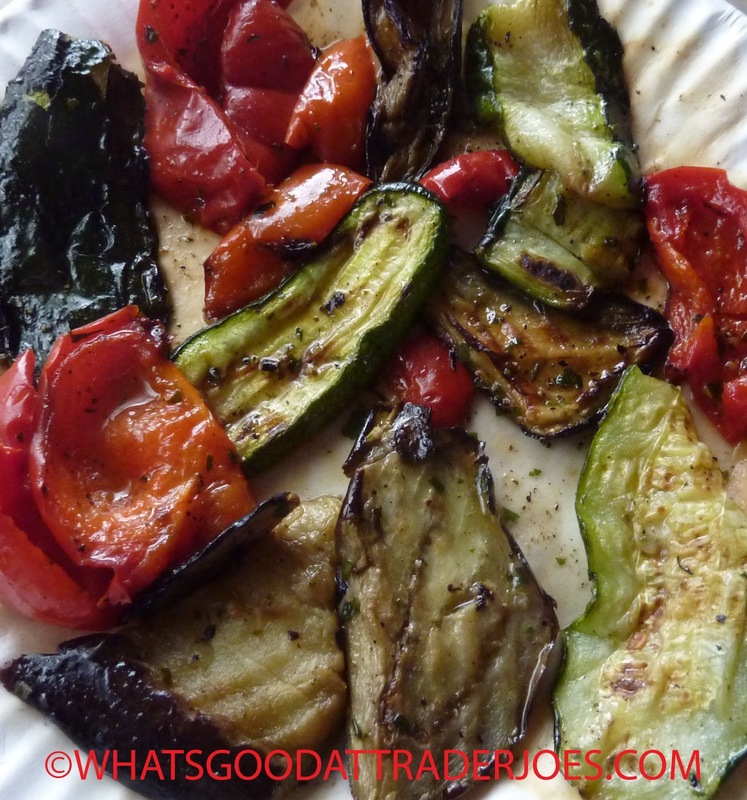 Of course, it would be a bit more work, but grilling your own eggplant, zucchini, and peppers might be more fun than thawing this nonsense for a full day in your fridge or half a day on your counter and still not knowing if it's the right temperature. I'm pretty sure this won't be a repeat buy for us. Three stars from Sonia. Two and a half from me. Bottom line: 5.5 out of 10.